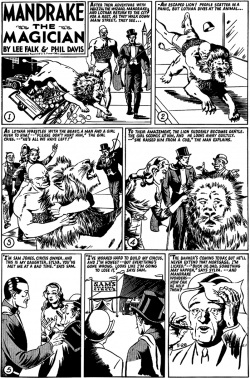 "The Circus Adventure" is the 27th Mandrake Sunday story. The story was written by Lee Falk and drawn by Phil Davis. At Sam Jones's circus there have been one unexplainable accident after another. A rhinolion, at the circus (Mandrake's magic). A giraffagator, at the circus (Mandrake's magic). A two-headed osterich, at the circus (Mandrake's magic). A monkey with elephant head, at the circus (Mandrake's magic). A fat lady, at the circus (Mandrake's magic). A thin man, at the circus (Mandrake's magic). A two-headed man, at the circus (Mandrake's magic). A midget, at the circus (Mandrake's magic). Carlo, a ringmaster at the circus. Gombo, a gorilla at the circus. Joe, an elephant at the circus. At the deepwoods.org index the title for this story is "The Circus Adventure", which is lifted from the plot. This page was last edited on 26 May 2016, at 05:57.